The first two cases are free, and the rest are available as in-app purchases. Layton Brothers Mystery Room, featuring genius investigator Alfendi Layton and his indefatigable assistant, DC Lucy Baker, is now out on the iOS store. The first two episodes - The Hand Sandwich, and The Bungled Burglary - are free, but the other seven files are only available as in-app purchases. Investigate nine crime scenes, cutting through the lies and sorting out the red herrings from the real clues, and then face the culprit in the final showdown! 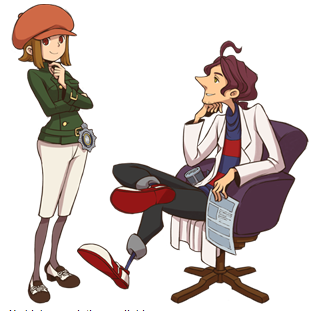 Alphendi is the son of Hershel Layton, the iconic Professor of the Layton series, and as the game progresses you may notice some changes in Alphendi's personality. This is part of the larger mystery; what's going on with Alphendi, and what - if anything - can be done about it? This was originally announced in 2009 as a DS title; Mystery Room is the first original Atamania game put together by Level-5. For those of you wondering just how much those in-app purchases are likely to be, the first - case files 3 to 6 - will set you back $2.99, while the remaining files will be $1.99.